Capturing sound, movement, and all the emotion of the day, videography keeps the memories of your wedding vivid for years. Here’s everything you need to know. How important is such a detailed recording? “The whole day was a whirlwind,” says Marissa Coyne of her December 2001 wedding in Cold Spring Hills, New York. “You can forget so much of what is going on.” Videography allowed her and her husband, Christopher, to once again experience the moments they remembered, and it also revealed things they had missed, including their parents’ teary smiles as the couple exchanged their vows. Couples also often find that, years later, their children love watching the video of their wedding. Are There Different Styles of Videography to Consider? The current trend for wedding videography is toward documentary-style work. These videos piece together the events of the day, often blending color with black-and-white footage for a natural and timeless approach. This seemingly straightforward style requires considerable artistic skill from the videographer, who must be able to capture the mood without special effects while keeping the focus on you. The more stylized wedding video utilizes some technical tricks like layering & editing to the beat to summon a mood. 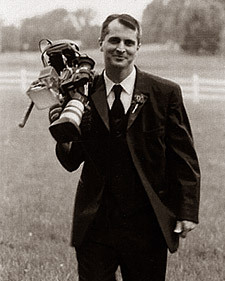 Many professional videographers use fade-outs and insert still shots, such as baby or family photos or first-date mementos. These approaches may incorporate music, interviews, special effects and titles. The best way to end up with a film that you will view again and again is to communicate with your professional in advance. Let the videographer know what attracted you to her work, such as the blend of candid moments and still photography. How the elements are combined during the editing is as important as the way the video is shot, says Jeremy Faryar Mansuri, owner of New York City’s LifeStories Films. Editing, he explains, “really sets the pace” of a video. Also discuss sound, including your choice of songs for background or theme and the mix of music with live, happy chatter that will accompany the final product. As for length, most videographers will offer a range from a thirty-minute summary of your day to an hour long documentary.